Obsidian is a very resistant block formed from lava. When mined with a diamond pickaxe, obsidian drops itself. Obsidian is created when a lava source block makes contact with water. Obsidian is also created from both flowing lava and source blocks as a result of rain and snow. Nethereyes, when killed, may drop obsidian. Obsidian can be used for build explosion-resistant structures. Obsidian is used in many recipes. 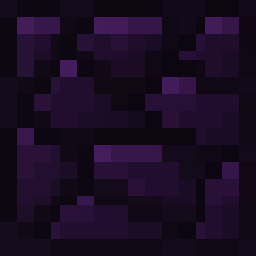 Obsidian is the second most resistant block in Mine Blocks(in the first place is the bedrock). The design of the obsidian has been updated in the update 1.27. This page was last edited on 24 December 2018, at 13:34.